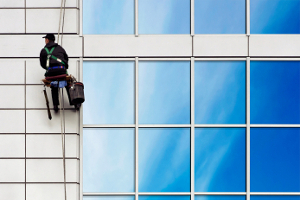 Get your office windows looking clean and bright with Las Vegas commercial window cleaning services from Southwest Ultra Clear. We clean windows on all types of commercial property both large and small regardless of how high up or how many floors. With over two decades of experience, we know what it takes to get the job right the first time in a manner that is safe, consistent, and executed with care and precision. Your business has to look good at all times. It’s essential to maintain a clean and bright appearance that leaves a first and lasting impression. No one understands this better than our Las Vegas window cleaners. We pay attention to every detail of every window that we clean both inside and out, so that you can focus on running your business. There is nothing attractive about a partially clean building where several areas were missed. With Southwest Ultra Clear you get a consistent washing throughout the entire building that makes your structure look good from top to bottom. You’ll appreciate it – so will your clients. In addition to cleaning your office exterior, we also offer full interior window cleaning for your business. We thoroughly clean each window so that both sides are spot free. We provide courteous service in a way that is non-intrusive or disruptive to your staff and clients so that you can continue business as usual. We use safe window cleaning chemicals that do not stain or damage your business interior or window frames or leave a residue. You’ll also love our fast efficient service. We get in and out in no time at all. Window cleaning at elevated levels is a hazardous job. The last thing you want on your mind is worrying about the safety of the company that you hire. This is why it’s vital to only hire a crew with extensive experience in highrise window cleaning. Southwest Ultra Clear has over 20 years experience cleaning tall structures all over Las Vegas. We have an exceptional safety record and only use first rate equipment which keeps our workers safe. We adhere to all safety codes and regulations. When you want only the best for your business, trust the skilled team at Southwest Ultra Clear, Las Vegas’s most trusted commercial window washers. Southwest Ultra Clear is a client driven company. This means that we work hard to achieve your total satisfaction and earn a long term business relationship that allows us to deliver superior service to your business for years to come. We offer free estimates, give you a complete list of all of our services at affordable rates that fit into your budget. We complete the job on time and leaving your building looking clean and attractive. Leave the guess work out of your Las Vegas commercial window cleaning with Southwest Ultra Clear. We are the window experts! If you are looking for a Las Vegas commercial window cleaning service, then contact Southwest Ultra Clear. Call us at 702-219-3525 or complete our online request form.